REACH requires all companies manufacturing or placing a substance on the EU market in quantities greater than 1t/year to register that substance with the European Chemicals Agency (ECHA). For legal reasons, only companies with a legal entity in Europe are allowed to submit a registration under REACH; however, non-EU companies may submit REACH registration by appointing an Only Representative to register on their behalf, in which case their importers will be regarded as downstream users and do not need to do registrations. If your tonnage band is between 100-1000t/y, you shall act now to prepare for REACH registration. Substances subject to Product and Process Oriented Research and Development( PPORD ) exempted from registration for 5 (+ 5) years; However, PPORD notification needs to be submitted. Substances can be categorized into two groups under REACH: phase-in substances and non phase-in substances. Each group has different REACH registration deadline. Phase-in substances("existing substances") enjoy benefits of extended registration deadlines if pre-registered before Dec 2008. The principle is that the higher the tonnage, the earlier the registration deadline. 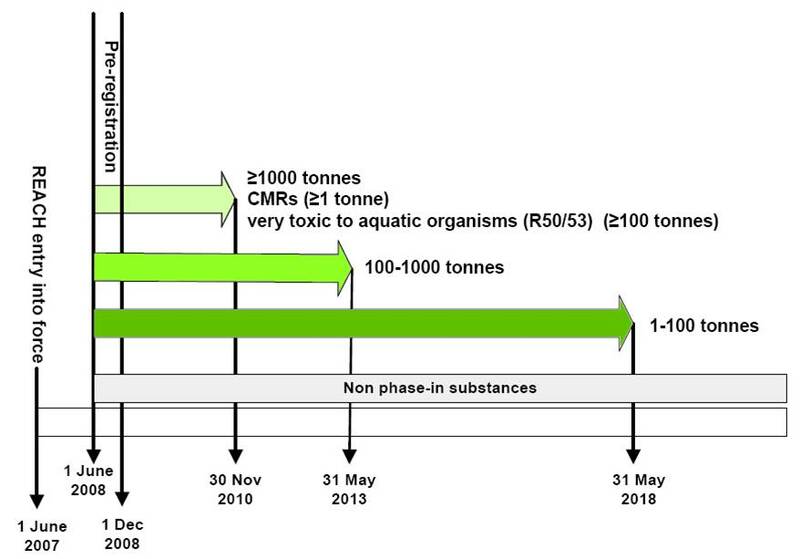 Substances classified as CMR1/2 or R50/53(100t/y+)need to be registered before 30 Nov 2010 (see next diagram). Non phase-in substances("new substances not covered by the definition of a phase in substance") need to be registered immediately before being placed in the EU market. Please click here to search whether your substances have been classified as CMR substances or R50/53 substances. It is listed in the European Inventory of Existing Commercial Chemical Substances (EINECS). It was manufactured in the Community, or in the countries accepted to the European Union on 1 January 1995 or on 1 May 2004, but not placed on the market by the manufacturer or importer, at least once in the 15 years before the entry into force of this Regulation, provided the manufacturer or importer has documentary evidence of this. It was placed on the market in the Community, or in the countries accepted to the European Union on 1 January 1995 or on 1 May 2004, before entry into force of this Regulation by the manufacturer or importer and was considered as having been notified in accordance with the first indent of Article 8(1) of Directive 67/548/EEC but does not meet the definition of a polymer as set out in this Regulation, provided the manufacturer or importer has documentary evidence of this. Phase-in substances that missed pre-registration cannot enjoy benefits of extended registration deadline and shall be registered immediately. However, first-time exporters/producers/importers who first began manufacturing or placing phase-in substances on the European market in excess of 1t/year after 1 Dec 2008, still can benefit from extended REACH registration deadlines by submitting a late pre-registration to the European Chemical Agency. Non-EU companies shall appoint REACH Only Representative to do so. 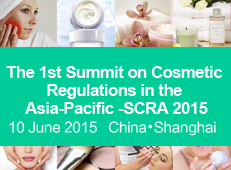 More info about how polymer is regulated by REACH, please click here. If your substance is on SVHC candidate list, you might need our SVHC notification service. Note 1: Intermediate registration and PPORD notification are much cheaper than REACH registration. If your substance meets the definitions of intermediate or PPORD, intermediate registration and PPORD notification are strongly recommended. Note 2: If you place a chemical on EU market, you shall also comply with CLP regulation. Please don't hesitate to contact us if you would like to find out whether you need to do reach registration or not and how much it might cost you. Our initial consultations are free.